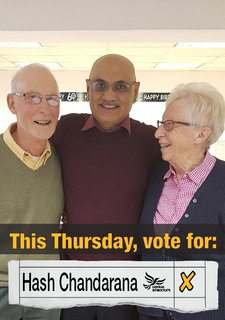 Vote for HASH CHANDARANA in the Belgrave By-election this coming Thursday, December 6th. Hash has lived his adult life in the Belgrave area where he has dedicated himself to local education. For over 36 years he has taught at Leicester College. He also runs a charity, Alpha Tutorials, that provides free education to unemployed adults. Hash wants to work with local officers for more effective policing, and ensure local renters aren't exploited. Hash wants to ensure that local schools are not turned into academies, that Belgrave children are allocated spaces in local schools, and that unemployed adults are given free access to Computer Skills and English Language classes to improve their employability. Hash wants to keep local Neighbourhood Centres and Libraries open, protect local Green space from Building Projects and ensure that vulnerable and ageing adults have adequate facilities to socialise and avoid isolation. If you want these things too, vote for Hash this Thursday! Published and promoted by Daniel Henry on behalf of Hash Chandarana (Liberal Democrats) at 14 Warwick Street, Leicester, LE3 5SD.